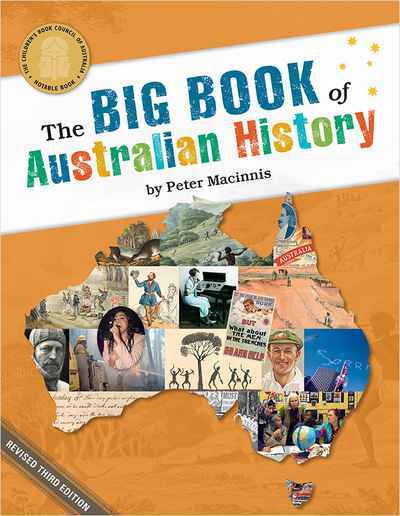 This is the revised third edition of The Big Book of Australian History, awarded ‘Notable Book’ by the Children’s Book Council of Australia in 2014. Drawing on the impressive collections of the National Library of Australia, this comprehensive book provides children with an interesting and engaging overview of the history of Australia. It covers many of the main events and people in the nation’s history. Packed with colourful images and interesting facts, The Big Book of Australian History introduces children to the many people and events that have made Australia what it is today. It also encourages them to think about how Australia has evolved as a nation. The book features stunning images from the collections of the National Library of Australia by artists (such as Joseph Lycett, John Gould and S.T. Gill) and photographers (such as Frank Hurley, Bruce Howard and Peter Dombrovskis). It also tells the stories of some of the most significant contributors to Australia’s cultural, political, sporting and social life, including Captain James Cook, Governor Lachlan Macquarie, inventor David Unaipon, aviator Charles Kingsford Smith, first female member of parliament Enid Lyons, Prime Minister Gough Whitlam, land rights leader Vincent Lingiari, and the first female prime minister, Julia Gillard.